As my brother John knows too well, I'm not much into the bike maintenance thing but I'm working on it. Today I put new chains on my cross and road bikes. (I now have a tool that checks chain wear.) I did the cross bike first and it went well. I counted the links and laid them out so they matched. New chain on the left needs shortening. I made a slight mistake with the new chain for the road bike. While placing the chain in the tool to remove the excess links, I moved the chain one link off and pushed the pin out of the wrong link. Since the Powerchain pieces won't connect to the outer plates I removed that link, which I believe makes me two links short. I rode the bike and went through all the gears. If I'm on middle chain ring and the smallest cog in the rear, I can't shift onto the big chain ring. But if I'm on any of the larger rear cogs, I can shift onto the big chain ring and then down to the smallest rear cog. There's still an "S" and the rear derailleur is not pulled too far forward. So it doesn't seem too bad and I'm guessing I'm okay until I get another chain in a couple of days. 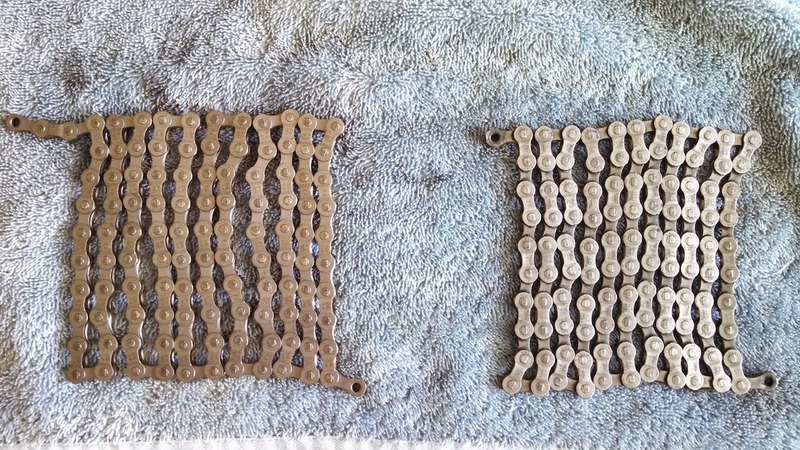 No need for a new chain, unless you are using it on a dif bike that requires less links. Just get a shimano chain pin or a sram power link and you can add length back. Your shifting problem doesn't jive with a short chain, but I could be overlooking something. Perhaps you have a direction specific chain that has torsional properties. New shimano chains are that way, there are inside and outside plates that help the chain move properly. "Perhaps you have a direction specific chain that has torsional properties." I have a chain-tool-thingamjig on my multi-tool. Looks good - danged if I know how to use it. Keep meaning to practice with it. I remember pulling apart chains when we were kids, but that was a long time ago. Think I need take a vacation at a bike repair school. Fortunately I had two chain tools when I was doing this because I broke one of them. I assume it was the cheaper of the two.